Did Someone Say Bacon? All about our Smoked Meats! 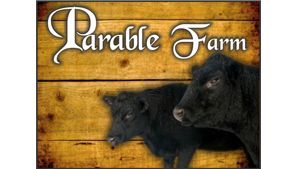 | Parable Farm, Inc.
Did Someone Say Bacon? All about our Smoked Meats! Posted 3/13/2017 9:11am by Sarah Parker. When it comes to brining and smoking cuts like ham and bacon, we go out of our way to keep the complex nutrition and "porky" flavor of our pastured pork. Nitrites, nitrates, and sodium erythrobate are commonly used to obtain a faster cure and result in smoked meat that is pink instead of brown. These chemicals have been well-studied, and based on the results of those studies we highly recommend avoiding them whenever possible! We worked with our butcher, Percy McDonald from McDonald Meats in Girard, PA, to design a brine and smoking guideline for our farm. The result is delicious and nutritious hams, ham steaks, hocks (for soup), and bacon, free of potentially harmful chemicals. Hams and ham steaks available now - brought to you by our local farm and our local butcher! Hams are approximately 4lb each fully cooked.